A new study finds the numbers of young people being accommodated by local authorities or homeless services across the UK to be over three times higher than those recorded by the Government, and highlights the 'hidden homelessness' of those forced to sleep on sofas of friends or relatives as they have nowhere else to stay. New research shows that 26% of young people aged 16-24 have had to sleep in an "unsafe place" due to homelessness, such as in a car, a car park, a tent in a public space, or on the streets—amounting to an estimated 1.4 million young people (one in six) who have slept rough or unsafely in the just last year, with just under 300,000 doing so on any one night. Around 83,000 homeless young people have been accommodated by local authorities or homeless services across the UK over the last year, according to a new study from the Cambridge Centre for Housing and Planning Research (CCHPR). The charity Centrepoint, who commissioned the research, say that this figure is more than three times greater than the statutory homeless figures as compiled and recorded by the Department of Communities and Local Government. Around 35,000 young people are in homeless accommodation at any one time across the UK, with hostels found to be almost always full or oversubscribed. Scotland assists the large majority of young people via homelessness legislation that requires local authorities to record all homeless people who approach them, even if they are not in a 'priority need' group. Elsewhere in the UK, young people are more commonly assisted without a formal homelessness assessment. 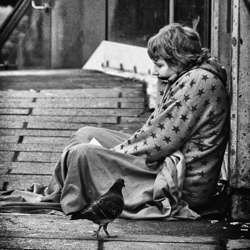 Official homelessness statistics outside Scotland only record the number of 'priority need' young people local authorities have a statutory duty to house, such as young parents or under-18s. Centrepoint say that thousands of young people who do not fit the narrow categories go unrecorded as a result, even if they have been rough sleeping. The research team analysed data collected from local authorities throughout the UK, and ComRes conducted a survey of over 2,000 young people that was then weighted to reflect the population at large. "Our research drew on data from a range of data sources, and filled in the gaps by speaking to staff hostels and homeless services in a sample of 40 local authorities throughout the UK. This enabled us to gain a more comprehensive picture of the numbers who were using homeless services than is possible from the recorded data alone," said Anna Clarke, a senior researcher at CCHPR in the University's Department of Land Economy. The research also aimed to get insight into the 'hidden homelessness' of sofa surfing among young people: crashing on the sofas of friends or family when they have nowhere else to stay. One in five have had to sofa surf during the last year, with 16% of all young people having done so for over a week, and 4% for over three months. In total, a third of young people said they had had to sofa surf at some point in their lives. The most common reasons given were: leaving a negative home environment or having parents unable or unwilling to house them. Relationship breakups and tenancy endings were also cited as common causes of sofa surfing. Young people who had been evicted for rent arrears spent the longest time having to sofa surf—an average of ten weeks over the past year. Sofa surfing was more common for men, those without British citizenship, and young people who have been in care or had a foster worker as a child. "Successive governments have been making policy in the dark as they have failed to grasp the sheer scale of youth homelessness in the UK," said Balbir Chatrik, Centrepoint's Director of Policy. "Young people typically find themselves facing homelessness through no fault of their own. As a society we owe them a national safety net devised from more than just guess work," she said. The team also looked at changing housing pressures for young people across the UK, analysing census data from 2001 and comparing it to 2011 to see changes in overcrowding in households. While overcrowding in both Scotland and Northern Ireland had dropped over that ten year period, in the rest of England and Wales overcrowding had gone up by around 3%, with the highest increase of 5.8% seen in London, indicating the growing pressure on housing in particular in London. "This research found higher numbers of young people experiencing homelessness than we had ever expected, and we'd very much like to explore the issue further to see if these findings can be replicated," said Clarke, who led the research. "The research has highlighted the risks of relying on administrative data and rough sleepers' counts for quantifying something that by its nature does not necessarily bring people into contact with those who collect the data," she said. "As we await a new budget that's likely to contain substantial cuts to welfare, I think the research also draws attention to just how precarious the housing situation of so many young people already is."